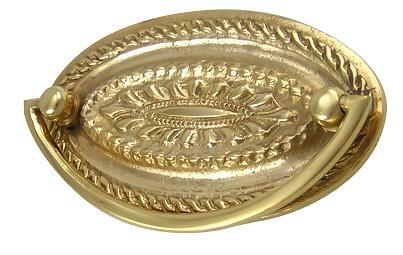 4 Inch Solid Brass Oval Drop Style Pull (Polished Brass Finish) - measures 4 inches wide and 2 1/4 inches tall. Center to center spacing measures 3 1/8 inches (79.37 mm 3 1/8 c-c). Comes complete with two rear mounting bolts. This oval bail pull is made in the Hepplewhite and Federal (Federalist) style and it is available in several finishes.